Treat your feet to cute, comfortable wedges! Now that the rain is gone, Toree will be your go-to sandal this season. 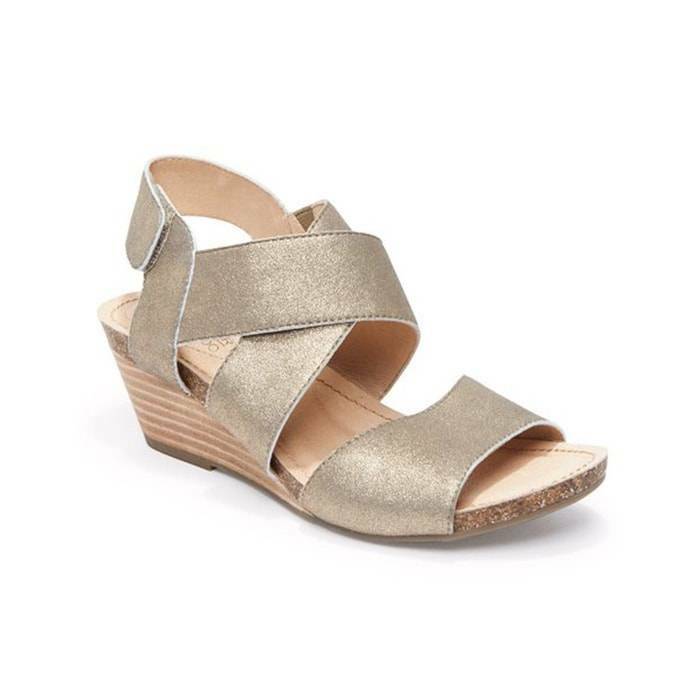 Adam Tucker Toree is a strappy leather wedge with memory foam cushioning and a stacked wedge heel; which is perfect to keep you comfortable and stylish all day long. Simple, yet stylish best describes this strappy memory foam wedge. Toree is a comfortable wedge with an amazing memory cushioned footbed. By cushioning your foot in every step, Toree helps reduce shock and pressure on your heels. Thus relieving discomfort from heel pain and softening your every step. This strappy memory foam wedge will keep you happy on your feet. 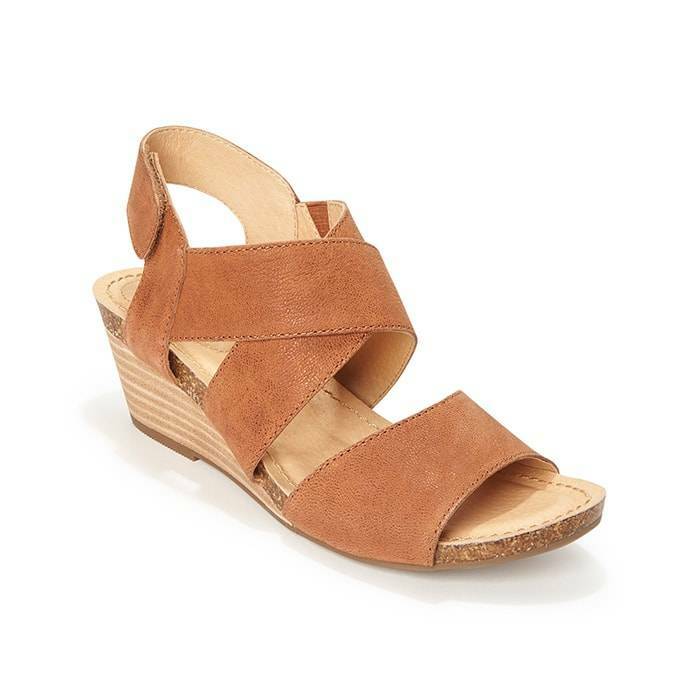 Not only is Toree a cute wedge but also a comfortable sandal with adjustability. 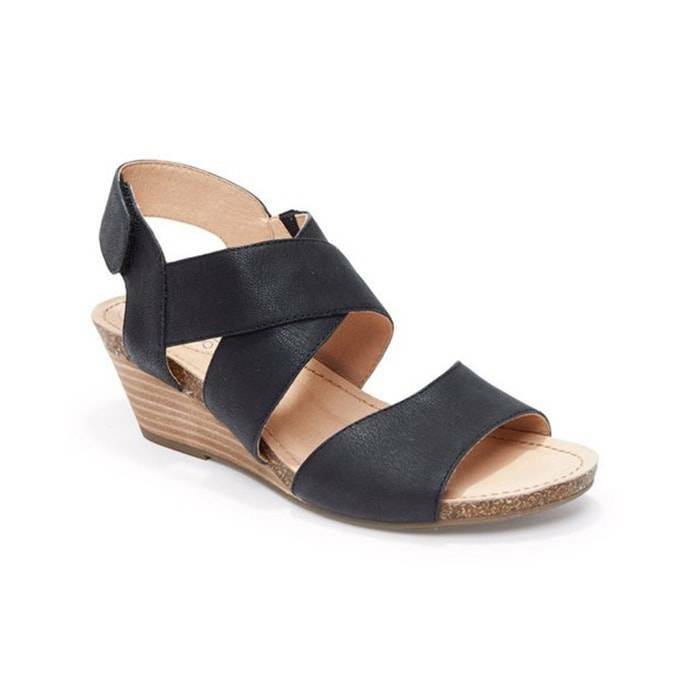 This wedge sandal features an adjustable hook and loop strap closure that adjusts to your foot with every step. With Toree you don’t have to worry about loose wedges rubbing on your ankle or toes. Simply adjust the wedge to your comfort level and carry on with your day in total comfort. With three color options to choose from in this strappy memory foam wedge, you can pair the Toree with almost anything in your closet. Don’t limit yourself and choose between Asphalt, Cuoio, and Black to match your changing wardrobe. Click here to find your size. Toree is an amazing strappy memory foam wedge that keeps you comfortable on your feet all-day long! Other wedges may be gorgeous but you know they give your feet a beating every time you slip them on. Stop hurting your feet and try a better pair of comfortable wedges with memory foam cushioning. If your current wedges are causing foot pain, heel pain, back pain or other foot problems, it may be time to replace them with a comfortable pair of Toree’s. Click here to schedule a free foot analysis. Click here to schedule your free foot analysis. If you are looking for Strappy Memory Foam Wedges in Anaheim, Anaheim Hills, Yorba Linda, Brea, Orange, Placentia, Costa Mesa, Santa Ana, Fullerton, Irvine, Villa Park or Tustin; then visit our store in Anaheim Hills for your footwear needs. If you are looking for Strappy Memory Foam Wedges in San Dimas, Glendora, Pomona, Covina, West Covina, La Verne, Azusa, Diamond Bar or Claremont; then visit our store in San Dimas for your footwear needs. If you are looking for Strappy Memory Foam Wedges in Rancho Cucamonga, Ontario, Upland, Fontana, Rialto, Chino, Chino Hills, Mira Loma, Eastvale, Colton or San Bernardino; then visit our store in Rancho Cucamonga for your footwear needs. If you are looking for Strappy Memory Foam Wedges in Riverside, Moreno Valley, Corona, Rubidoux, Loma Linda, Grand Terrace, Redlands or Norco; then visit our store in Riverside for your footwear needs. If you are looking for Strappy Memory Foam Wedges in the Temecula Valley, Murrieta, Fallbrook, Lake Elsinore, Wildomar, Hemet, San Jacinto, Pala, Sun City, Menifee, Canyon Lake, Perris, Bonsall or Anza; then visit our store in Temecula for your footwear needs. If you are looking for Strappy Memory Foam Wedges in Indio, Coachella, Thermal, Vista Santa Rosa, Valerie; then visit our store in La Quinta for your footwear needs. If you are looking for Strappy Memory Foam Wedges in Cathedral City, Thousand Palms, Palm Desert, Palm Springs, Desert Springs, Rancho Mirage or Bermuda Dunes; then visit our store in Palm Desert for your footwear needs.